DRUMHELLER, ALBERTA, CANADA–The last activity for our IPREP group this summer was a guided visit to the Royal Tyrrell Museum of Palaeontology. David Lloyd, a paleontological technician at the museum, gave us a fantastic “behind the scenes” tour of the preparation laboratories and collections. The emphasis of the museum and the town is dinosaurs, of course, and I’ve never seen a better collection up close, but there were plenty of invertebrate fossils as well. The museum has one of the best exhibits on the Burgess Shale in the world, including a giant diorama visitors essentially walk into. The Royal Tyrrell Museum of Palaeontology sits in a basin with badlands exposures of dinosaur-loaded Late Cretaceous terrestrial sediments. The dinosaur reconstructions inside and outside the museum are very well done. 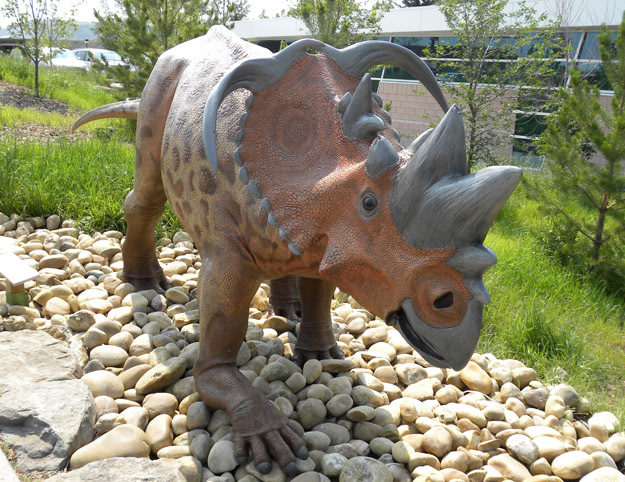 This is a Cretaceous pachyrhinosaur with fearsome ornamentation. 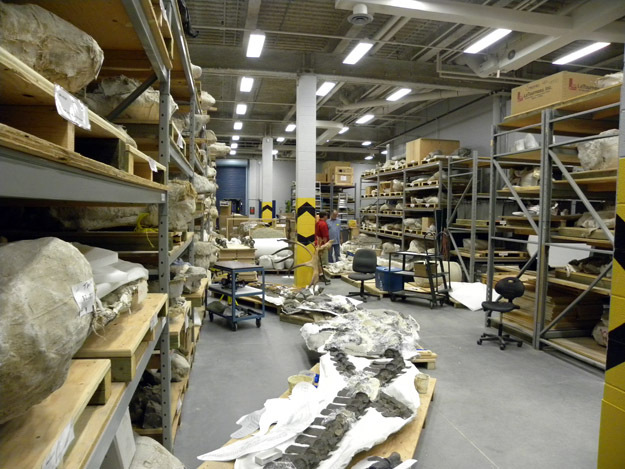 The main collections storeroom is filled with paleontological treasures. 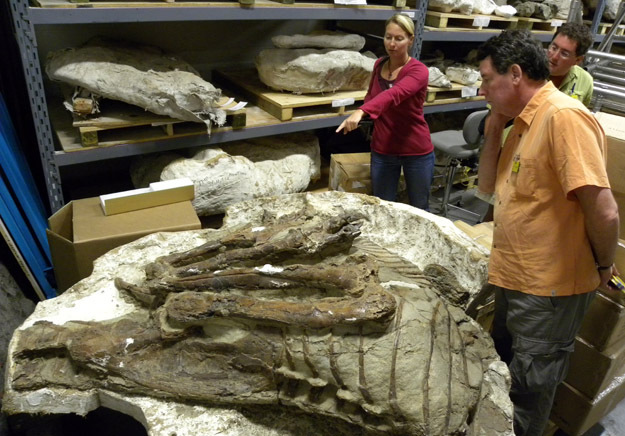 Rebecca Perlman, Matt James, and Kurt Burmeister (in the back) examine an opened plaster jacket with dinosaur fossils inside awaiting preparation. Layers of plaster and burlap were applied to the fossils in the field to protect them during transport to the museum. This technique goes back over a century. 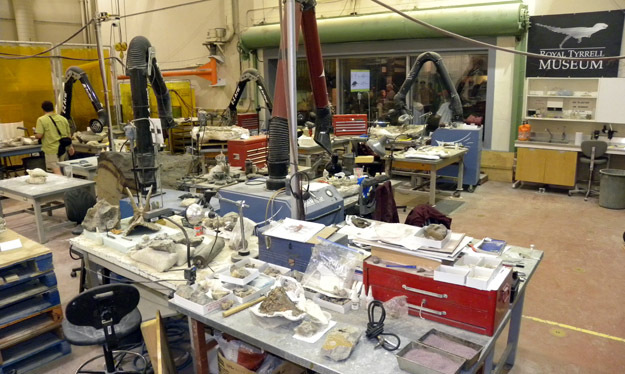 This is the main paleontological preparation lab at the museum. It is filled with equipment designed for the most part to remove rock from bone. On the left is a giant ammonite we found mounted in a dim hallway. They are usually about the size of a hand! On the right is part of the Burgess Shale diorama showing the ubiquitous Marella. FIELD, BRITISH COLUMBIA–The IPREP team left the Canadian Rockies yesterday morning with many educational and research ideas, new friends, and thousands of photographs to be shared with students and colleagues. It was an extraordinary experience. We thank Matthew James of Sonoma State University in California for organizing this complex trip, and Randle Robertson of the Burgess Shale Geoscience Foundation for his generous support of our work and arranging the trail guides. I highly recommend a visit to Field, British Columbia, for anyone interested in paleontology, geology, and natural history. If you go, I guarantee you’ll enjoy your stay at the immaculate and well-designed Fireweed Hostel. Kim and Craig Chapman were friendly, efficient and generous hosts. There is one more post to come from this trip — a visit to the Royal Tyrrell Museum of Palaeontology in Drumheller, Alberta. 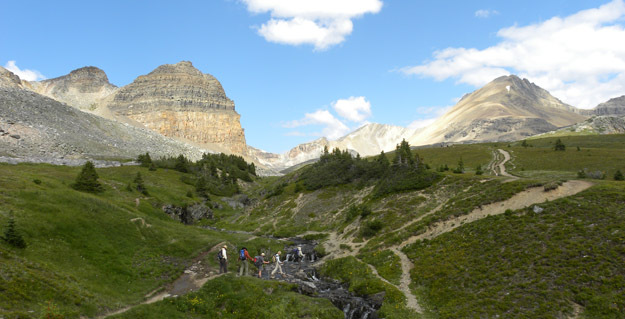 The IPREP team just below Helen Lake on the hike to the Cambrian stromatolites. LAKE LOUISE, ALBERTA–On our free day the IPREP study group (this apparently means “International Paleontological Research Exchange Program”) drove to the spectacular Lake Louise in Banff National Park for a hike up the valley to the “Plain of Six Glaciers”. It was one of those many places where I know just how fortunate I am to be a geologist. The weather could not have been better, and there was even a tea house near the end of the trail for sandwiches, peachade, and perfect chocolate cake! 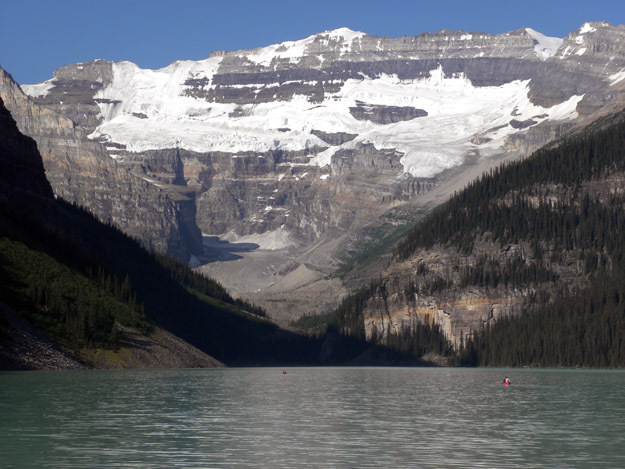 Lake Louise as seen from its outlet looking up the valley. Our hiking trail proceeded from here along the right side of the lake and up the valley almost to the ice of the hanging glaciers. We could not help but be delightfully distracted by these brilliant trace fossils in the rocks along the lake shore. 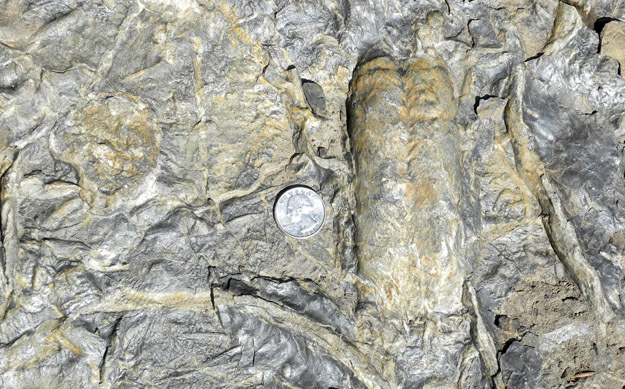 The bilobed structure which looks like a deer footprint is an excavation made by a trilobite -- the trace fossil itself is called Rusophycus. The sinuous tubes are trails made by burrowing worms. These features protrude form the rock surface because they are actually on the bottom of the bed. Sediment filled the original holes and is now preserved as ... wait for it ... convex hyporeliefs. You knew we had a name for it! (Middle Cambrian, Gog Formation). 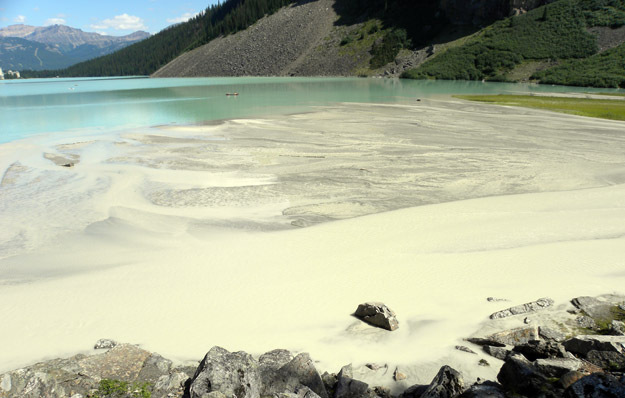 The water of Lake Louise has a pastel emerald color because it is loaded with very fine sediment called "glacial flour". It is produced by glacial ice finely grinding the rocks in the highlands above. This sediment fills the streams to near capacity and makes an extensive delta at the inlet to the lake. 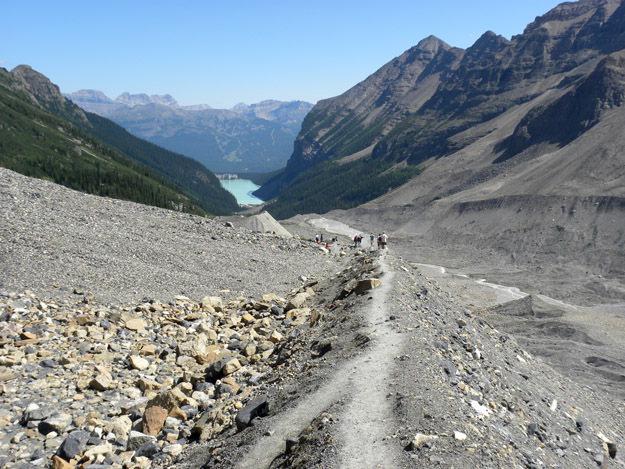 Looking down the valley to Lake Louise from one of the many glacial moraines. This unsorted sediment was pushed here by glacial ice when it filled this valley. 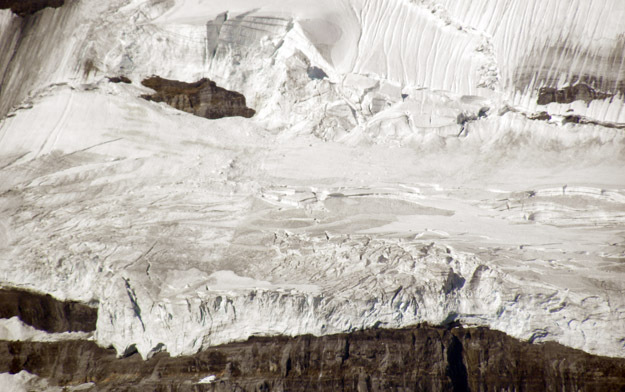 The glacial ice above the Lake Louise valley. This is a classic hanging glacier. We had the privilege of seeing (and mostly hearing) a large piece of ice break off and crash into the valley below on this warm and sunny day.